Prep time: 10 minutes (and freeze for several hours). Bake time: 15 minutes (and freeze for 1 hour). If there’s common ground between skateboarding and Halloween (and I suspect that there’s plenty), it starts with a healthy appreciation for grotesque imagery. Both Halloween and skateboarding relish in skulls, severed limbs, and satanic paraphernalia, with the primary difference being that skateboarding doesn’t need a season to boast its artistic license. If you haven’t checked out Seb Carayol’s well-researched anthology of subversive skateboarding graphics, Agents Provocateurs, it’s well-worth the purchase just to get a delicious history lesson in all the ways skateboarding pays homage to things that will make your skin crawl. For instance, devil horns and a trident are a Halloween staple, whereas skateboarding has the graphic that Jason Lee rejected (and Natas loved); skulls and spider webs are used to decorate lawns across America, whereas skulls were the foundation of Powell-Peralta’s graphics for over a decade. Bats, zombies, and gore galore—if it’s a staple of Halloween festivities, it’s been on a deck. 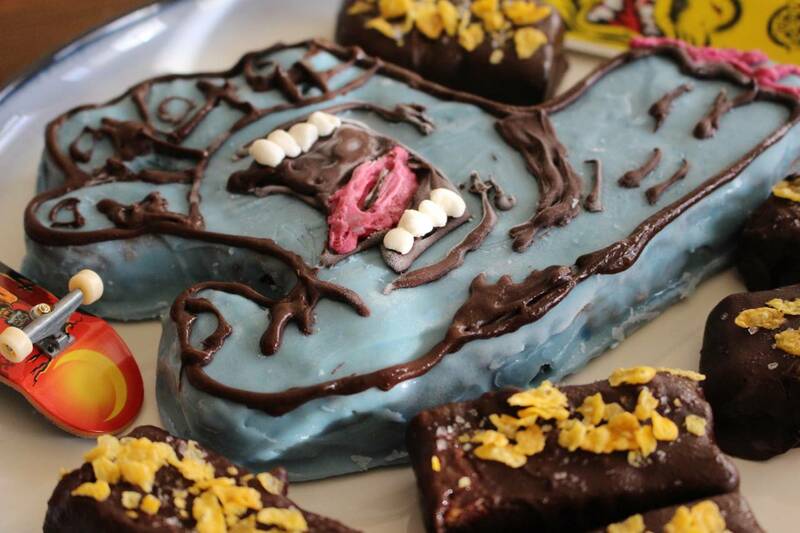 Seeing as how this is a vegan blog, I’d like to clear the air and admit that even vegans can have a sweet tooth on Halloween, and, while seitan can imitate meat and cashews can imitate cheese, the lack of vegan candy bars out there presents a notable detour for maximum Halloween enjoyment. Sure, you can pull up lists of the top vegan candies out there and find out that Airheads, Smarties and off-brand caramel chews are cruelty-free, but let’s not be coy: when you trick-or-treated as a kid, the houses that passed out those candies were the ones you wanted to egg. 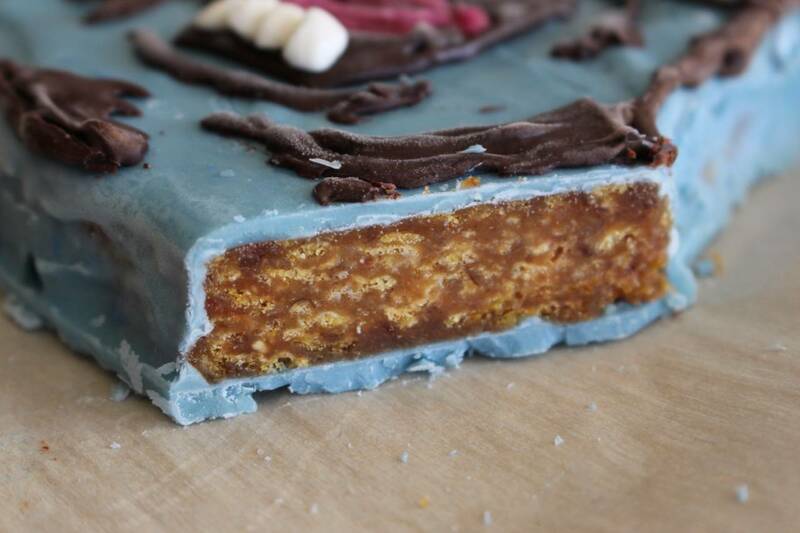 I’ll go ahead and say it: the best candy bar out there is Butterfinger. Sure, Snickers, Kit Kat and, Reese’s all give it a good run, but (at least by a slim margin) the delectable balance of creamy chocolate and crunchy whatever-the-hell-is-in-a-Butterfinger is unparalleled. While Bart Simpson may be the most obvious commonality that skateboarding and Butterfinger share, skateboarding’s affinity for hands and fingers shouldn’t be overlooked: from Justin Eldridge and James Craig popping their fingers back into socket, to Toy Machine’s knuckles logo, hands and fingers have enjoyed some of the most preferred spots in skateboarding’s folklore. Perhaps the most iconic hand/finger graphic of all time, however, is Jim Phillips’s Screaming Hand, which celebrated its 30th anniversary last year (bonus info, did you know that the screaming hand was partly inspired by Jim’s first-hand (no pun intended) viewing of a dead body? How “Halloween” is that?). 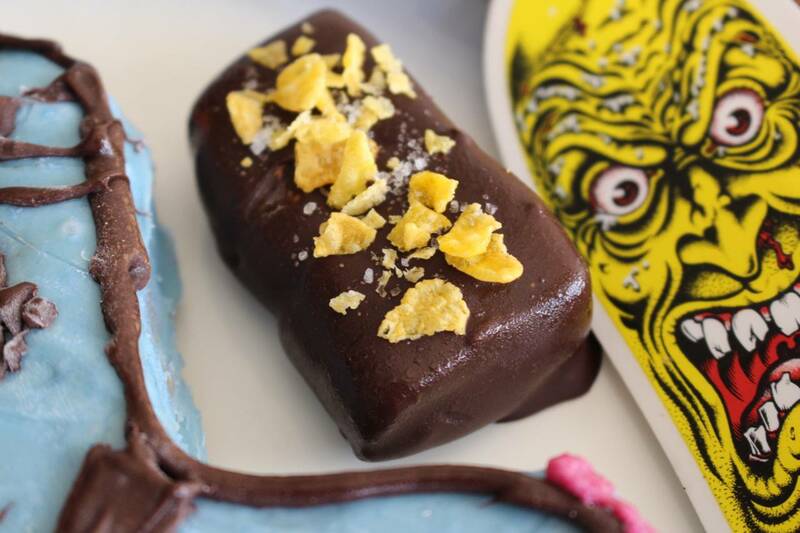 In celebration of Butterfingers, which are part and parcel to a delicious Halloween, and the hands and fingers that compose skateboarding’s vivid (and sometimes macabre) imagery, I present this week’s recipe: Screaming Vegan Butterfingers. Let’s be clear: I present 99% of my recipes as healthy, balanced meals. This is very much a guilty pleasure and a departure from the typical healthy recipes I offer. 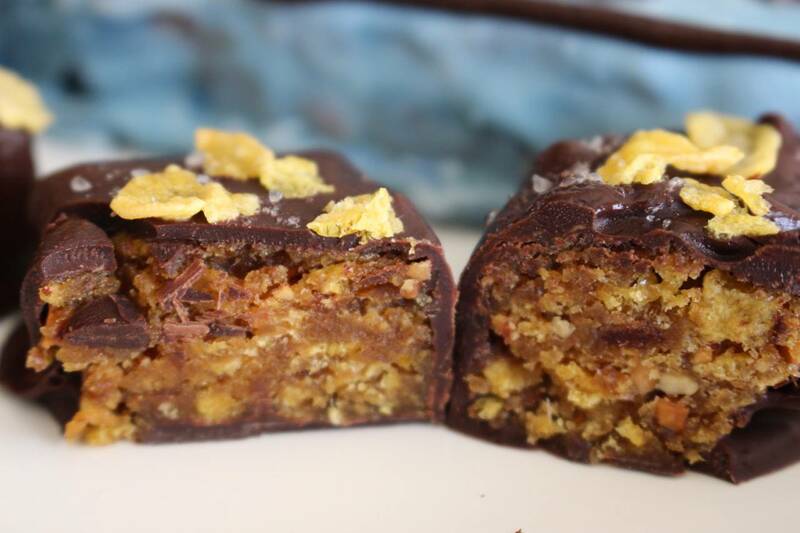 While it utilizes dates, peanut butter and corn flakes instead of mystery ingredients that are in a typical candy bar, this recipe should be enjoyed in moderation. The way I see it, what good is a diet that doesn’t cater to the sweet tooth on Halloween of all nights? Additionally, note that this recipe can be as simple or complex as you want to make it. If you’re just making the chocolate bars, this recipe is exceedingly simple. If you want to start making your own cutouts and are looking for different colors, it’s as complex as you want it to be (for instance, multi-colored designs dictate white chocolate and food dyes—vegan white chocolate is almost impossible to find in the U.S. and therefore I ended up finding a simple recipe to make my own; vegan food dyes are also pretty rare, but you should be able to find them in Whole Foods or synthesize your own). Without further ado, let’s crack our knuckles and get to it! First thing’s first, prep the filling. 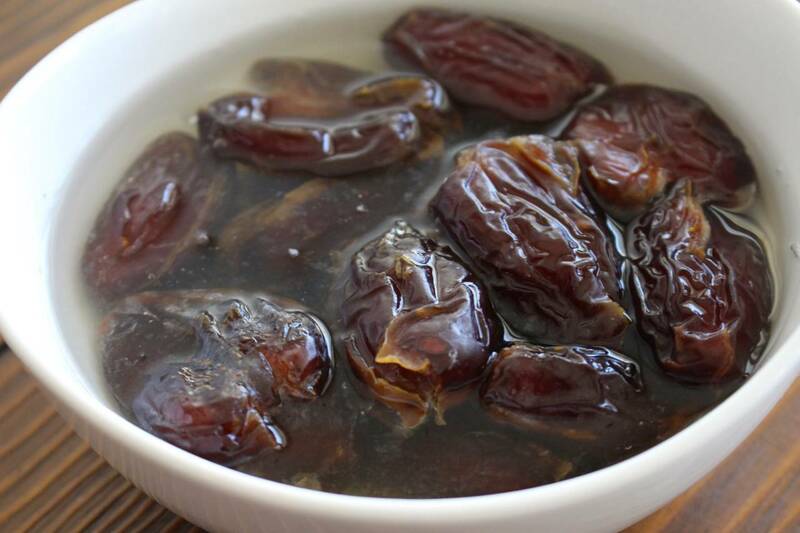 Pit the dates and then soak them in hot (but not boiling) water for 5 minutes. You only need enough water to make sure the dates are covered (see photo). While those are soaking, portion out the corn flakes in a large bowl and crush them to your desired consistency (smaller bits will be easier when it comes to cutting the bars and coating them). 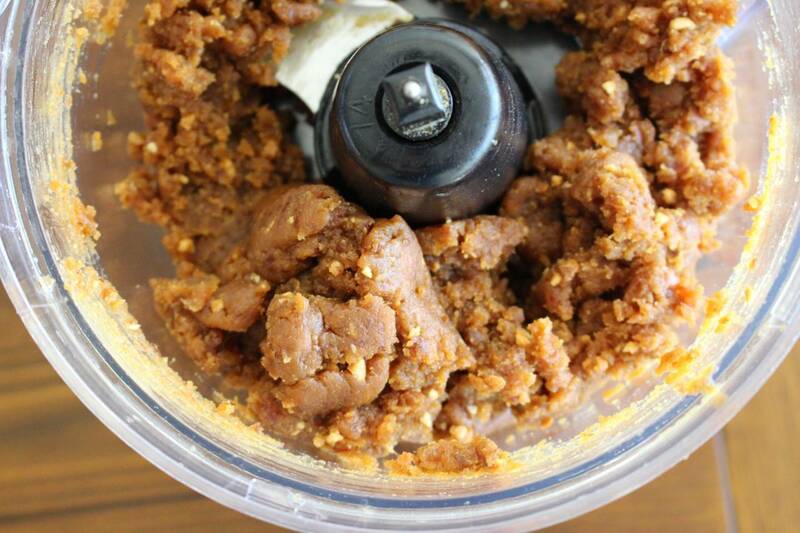 Drain the dates and throw them into a food processor with the peanut butter and the maple syrup. Process for 20-30 seconds or until it is an even, consistent mix. 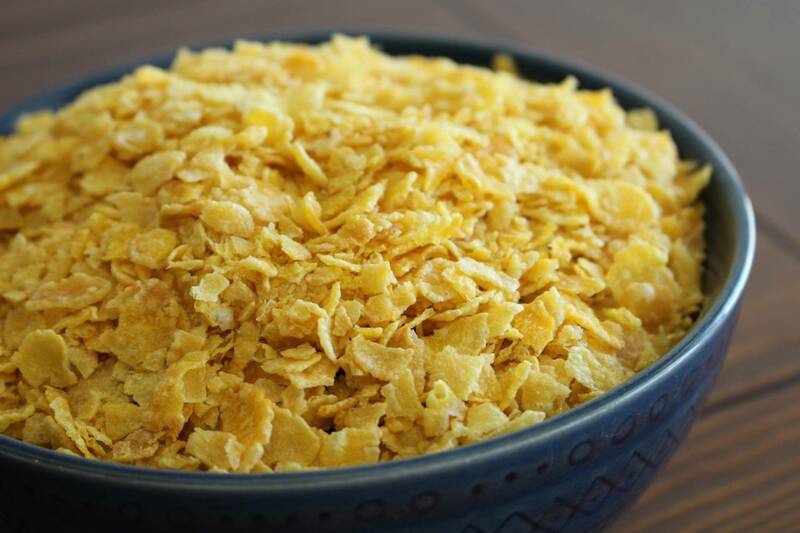 Add the mix to the corn flakes and mix with a spoon or your hands until the corn flakes are entirely folded in. Place the mixture into a parchment-lined brownie tray (or tray of your choice, depending on how thick you want the bars) and leave in the freezer for 2-3 hours. If you’re planning to make any wild shapes, it helps to cut the shape out after freezing for 1 hour – this will help it keep its shape, but avoid having it too frozen to cut accurately. 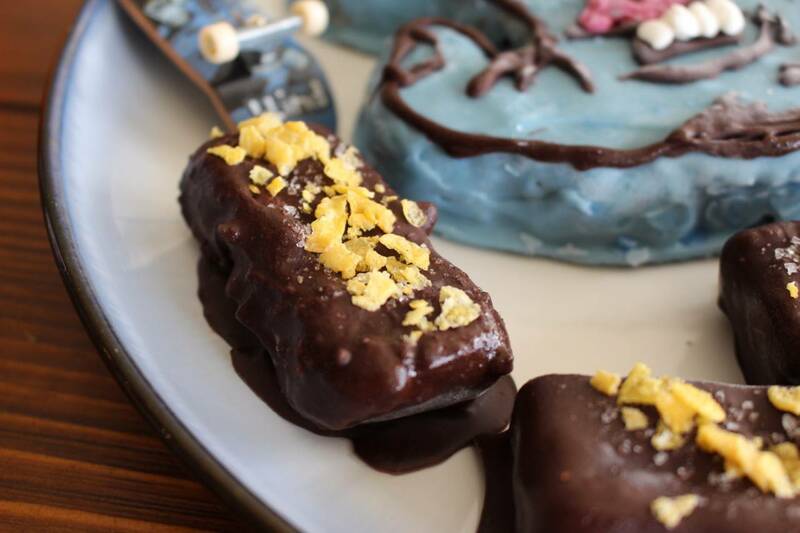 If you’re making the simple butterfingers, start melting the chocolate about 10 minutes before taking the bars out of the freezer. 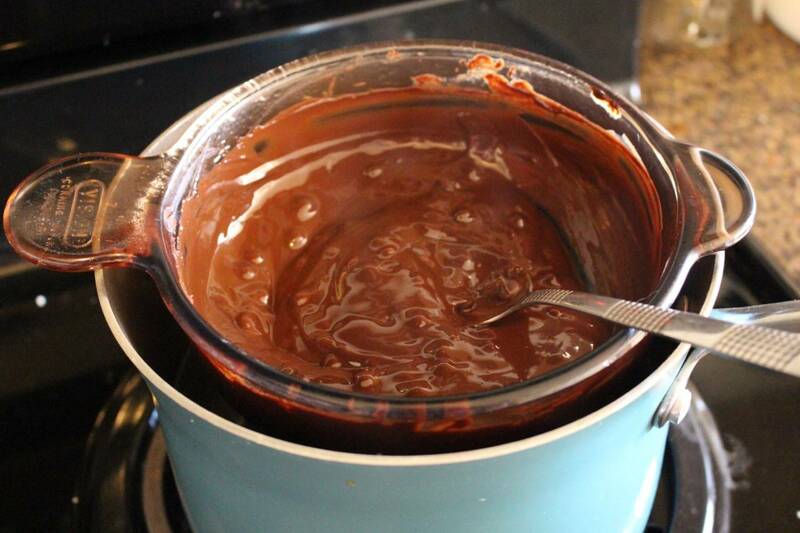 If you have a double boiler, use that to melt the chocolate on low heat. If you don’t have a double boiler (like me), you can recreate this by filling a pot with a few inches of water and topping it off with an oven-safe glass tray that won’t fall in, but still leaves room for steam to escape (see photo). It is very important that you make sure there is some room for steam to escape—your Halloween (and skin) will be ruined by an explosion of boiling water and melted chocolate. Bring the water to a boil, then down to a low simmer and place the dish and the chocolate on top of the pot, stirring occasionally with a metal spoon or whisk as the chocolate melts. Do not simmer above a low heat, as this will burn the chocolate. Lastly, if you can’t recreate a double boiler, you can microwave in a glass dish, but be sure to do so only 10-15 seconds at a time, as the chocolate will burn very easily. 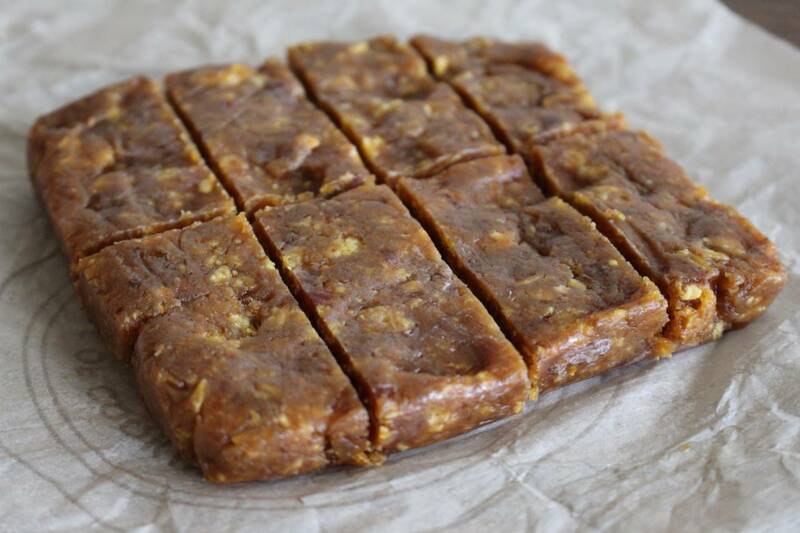 Take the filling out of the freezer and cut into 16 equal-sized bars (or, if you made a stencil and have some left, cut into however many bite-sized bars you can). Using a fork or a toothpick, dip the bars into the chocolate until they are completely covered and set on parchment paper to solidify. If the chocolate is too thick, add some refined coconut oil ½ tsp at a time until it reaches the desired consistency. For an added accent, add a sprinkle of crushed corn flakes and sea salt. Place them back in the freezer for one hour and then they are ready to eat! If you’re making more intricate Butterfingers and need white chocolate, chop or grate the raw cocoa butter into smaller bits and follow the same double-boiling procedures in step 3. Once it is boiled down, add the coconut oil and stir until they are blended together. In this process ensure you are using a metal spoon or whisk, rather than wood, to avoid adding any unnecessary moisture. Once they are blended, whisk in the sugar and vanilla until dissolved. If you are saving the white chocolate for later, you can pour it into an ice cube tray and freeze for one hour, adding the food dyes after melting it again. If you’re going to use it immediately, you can pour it into separate bowls for separate colors and add the food coloring fresh off the stove. Repeat step 4 above with the dyed white chocolate and create your masterpiece. If you are adding intricate details, it helps to do a base coat in whatever color you have most of, then freeze for one hour before detailing. If you try to detail too much at once with freshly-melted chocolate, all of it will inevitably run together. Freeze your masterpiece for one hour, then enjoy! Here’s Magnus Bordewick’s Next New Wave entry from the first issue of Berrics Magazine.